Ardovino's Desert Crossing is proud to host the 18th Annual Artistic Celebration of Our Mountains Exhibition featuring area artist showcasing the beauty of our region's mountains. Join us Thursday, Sept. 27, for the Opening Reception from 6 - 9 p.m.
Hors d’oeuvres and cash bar available. The displayed artwork continues through Sept. 2019. Please call 575-589-0653 x3 for more information. Save the date for the 4th of July! Call 575-589-0653 for more information or to make your reservation. Join us Sunday, May 20 for a special DinoTrack hike, dinosaur-themed dinner, and animal tracking Nerd Night talk guided by Dr. Kappus. Feel free to join us for Dr. Kappus’ talk or the talk and the special hike; see the schedule for more information about each activity. Join us Mother's Day Weekend to learn why ADC is the most romantic location in the area for weddings, rehearsals, proposals, anniversaries and more! Join us for a special screening of George Lucas' iconic 1977 film, Star Wars, A New Hope. Featuring a Star Wars themed dinner and Star Wars inspired cocktails. Jay Duncan will provide movie trivia and guests are encouraged to come in costume! Prizes will be awarded for the best comstumes! Now in its 14th year, the St. Patrick's Day Party is a favorite in El Paso. With live music by The San Patricios and The Fox and the Sound, traditional Irish Food and Drink and an all-around great time... you DO NOT want to miss it! Doors at Sunset Hall open at 5 p.m.
For more information, call 575-589-0653 (x3). Make plans to bring your someone special to ADC for an unforgettable evening! The menu for the evening was created by our Chef de Cuisine, Fidel, who has extensive experience in Spanish cuisine. $55 per person. For more information, please call 575-589-0653. Carlos Montufar is CEO of non-profit Phoenix World Arts Collective and director of WorldDANCE and Café Flamenco in Phoenix. He has collaborated with groups such as Inspiracion Flamenca and Zona Flamenca, co-directed Flamenco Por La Vida and teaches Flamenco lecture demonstrations to communities in New York and North Carolina through Carlota Santana's Flamenco Vivo. After moving to Phoenix in 2001 from El Paso, TX, his career path went from Architecture to performance after he began taking his first Flamenco lessons with Laura Moya. From there, he joined Martin Gaxiola’s CALO Flamenco and in 2007 moved to Albuquerque, NM to study with the nation’s top Flamenco repertoire company YJASTROS, under director Joaquin Encinias. In 2009, Carlos moved to Las Vegas, NV to dance in CHARO’s production of CHARO: A Musical Sensation. 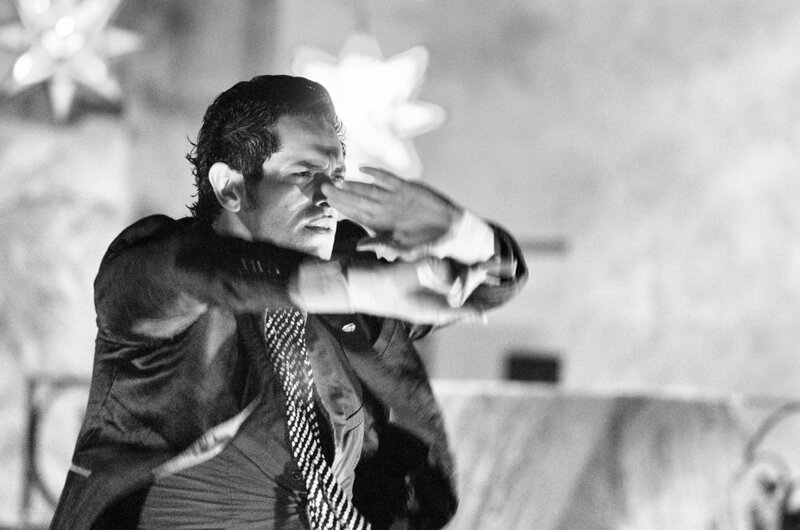 He moved back to Phoenix later that year, dedicating his time to Flamenco Por La Vida for the following six years. He currently produces shows and organizes workshops that bridge the Phoenix Community to world artists who reside there. Meagan Chandler unexpectedly stumbled across Flamenco at the age of 14 and knew immediately it would be lifetime love affair. In Jerez de la Frontera, Spain, she studied dance with Ana Maria Lopez before being drawn into the world of Flamenco singing by La Chiqui de Jerez. She has continued to cultivate herself as as cantaora from the stage in Colorado and New Mexico for more than 15 years. Meagan has toured nationally, singing Flamenco with such groups as Flamenco Vivo Carlota Santana, Maria Benitez’ Next Generation, EmiArte Flamenco, Julia Chacon’s Inspiracion Flamenca, the CBJ Flamenco ensemble, Flamenco Denver and Alice Blumenfeld’s Abrepaso Flamenco. She has extensive experience in arts education with Carlota Santana’s Project Olé based in North Carolina and teaches Flamenco rhythm, singing and party dance. She continues to explore what it means to be an American Flamenca and hold tenderly both the profound tradition and possibility of bridging between other art forms. Jake Mossman began playing the guitar and composing at the age of twelve and drew inspiration from a wide variety of music before focusing on Classical and Flamenco guitar. Before completing a Bachelor’s degree in Classical Guitar Performance at the University of New Mexico in 1997, Jake had become immersed in the Flamenco scene created by Maria Benitez in Santa Fe, in accompanying the dance classes of Pablo Rodarte, and the classes taught by the Enciñas family in Albuquerque, and their recurring Flamenco Festivals which have turned Albuquerque into a mecca of Flamenco in the United States. The simultaneous study of Classical & Flamenco led Jake on a lifelong search for the balance between melody and rhythm, tradition and innovation, and the fusion of two very different technical approaches. In 2000, after two trips to Spain, Jake relocated to Los Angeles, for four years, where he studied with Adam del Monte, performed Flamenco regularly and taught Flamenco at Pasadena City College. During his third visit to Spain, he met his future wife, and in 2005, they relocated to Las Cruces, NM after a long road-trip through the Southwest. Jake continues to compose and perform Classical and Flamenco Guitar, and is the owner of Las Cruces Music, LLC, which is dedicated to producing authentic Flamenco concerts in Las Cruces, NM. Open to children and families living in the city of Sunland Park, NM, the Dream Big Reading Event is part of the "I Have a Dream Reading Program." For a complete menu, visit: ADC New Year's Eve! Join us Sunday, December 3, for the finest, longest running Holiday Market in the area. For 13 years, the area's finest local artisans have offered myriad of unique products for shoppers in the area. Plan on joining us for brunch, take pictures with Santa, enjoy caroling from the choir at El Paso High and even learn a thing or two at our cooking demos. This year, we've proudly expanded the market to cover the entirety of our property, so great gifts for your family and friends will be easy to find! We are currently accepting vendor applications. If you're interested in selling your hand-made craft or treat, give us a call at 575-589-0653 (x6) to learn more. Twenty years ago, Ardovino's Desert Crossing opened (after extensive renovation) under the direction of Robert and Marina Ardovino as the area's premier banquet facility. Five years later, as part and parcel of a much grander plan for ADC, the restaurant opened - serving some of the area's finest cuisine, wine and spirits. Shortly after that, ADC started the area's first (and still the only) true farmers' market. We are honored to have seen so many of you walk through our doors to dine, celebrate and shop with our exceptional vendors. Join us again this weekend to raise a glass with us, take a few trips down memory lane and discover why, 20 years later, we truly are like nowhere else. Friday night: 6 - 9 p.m: Sample some of our newest menu items and take a walk around our beautiful property to learn how far we've come! Tim Thompson takes the stage at 7 p.m.
Saturday: Shop at our Farmers' Market and join us for brunch. Select vendors are 10% off. Too early for you? Our Mecca Lounge is open in the afternoon for drinks and a limited menu... and the Murphy Bushaw Patterson Trio performs live in the gallery for dinner. Sunday: We're open for brunch and Classics at the Crossing (with the Sunset Film Society) presents "The Wizard of Oz" at Noon (admission is free). If you're in to fishing, the Mesilla Valley Fly Fishers is co-hosting the Fly Fishing Film Tour in Sunset Hall. Admission is $35 and includes brunch. Proceeds benefit the Mesilla Valley Fly Fishers. If you can't make it to the restaurant on Thursday, how about checking us out at the 2017 Taste of El Paso? Tickets are on sale now at all Ticketmaster Outlets. Be sure to take a look at the VIP ticketing option, where food and drink will be served for you as well as you recieving a reserved table for your party size. Join us for the opening reception of this special exhibition featuring ardovino’s desert crossing as seen through the eyes of the Plein Air Painters of El paso. Join us for the Second Annual Salvation Army Benefit Concert at ADC! Proceeds from this year's concert will be directed toward hurricane relief. Free Admission. Gates open at 6 p.m.
We had so much fun with the original, we thought we'd do it all over again. Join us for Part 2... More great Italian food, more great Corleone adventures, more great times at ADC. Not many of you dressed up at the original... we're giving you another chance. Consider it our second offer you can't refuse. Tickets are $30 (plus tax and gratuity). Call 575-589-0653 (x3) for reservations. Have plans for the 4th? Why not spend it with us? As past of our year-long 20th Anniversary celebration, we're hosting a huge Independence Day party! Live music by El Paso's most dangerous band, Hypnosis, an all-you-can-eat buffet and an amazing view of the surrounding fireworks displays. Come out... celebrate and share the love! Doors open at 5 p.m.... fireworks start at approximately 9:30 p.m. Adults: $34.95 plus tax... Kids 5 - 12: $14.95 plus tax. Reservations are recommended 575-589-0653 (x3). Join us for our Annual Father's Day movie event in Sunset Hall when Sunset Film Society will present Indiana Jones and the Raiders of the Lost Arc. Details to follow... and we assure you they will be snake-free. The Animal Rescue League of El Paso will hold its 16th Annual "Dinner with Friends" fundraiser on Saturday, May 6, from 6 to 10 p.m. at ADC. Yappy Hour and Silent Auction begins at 6 p.m. Dinner and additional activities are from 7 - 10 p.m.
Join us for great food, great fun and a fabulous auction! Tickets are $75 per person or $750 for a table of 10. For more information, call 575-589-0653 (x5). Join us for a Cinco-De-Mayo Pop-up class this Friday! Come to LTB and then have a margarita with us! Bring your spouse, friends and family. ¡Feliz Cinco De Mayo! Join us Sunday, April 23 at 4 p.m. for a special Classics at the Crossing movie event featuring Francis Ford Coppola's epic recreation of Mario Puzo's best-selling novel and a Godfather-inspired buffet. Tickets are $39 per person and proceeds will benefit the Sunset Film Society, who will be celebrating their third anniversary showing movies at ADC. For more information, or to make reservations, call us at 575-589-0653 (x3). Come experience a full-body workout that lifts and tones in record time. On the new Camino Real Skydeck. Join us for brunch and drinks in the restaurant after! New this year! Our exclusive wedding event will feature some of El Paso's finest wedding vendors – Ella Blue, From This Moment Wedding Chapel, Patrick Carey Events, Table Occasions, Fenix Foto, Laura Carillo, Smallcakes, El Paso's Finest DJs and Ton of Linens. Take a walk around ADC, take in our vistas and imagine just how beautiful your wedding - or next special event - can be. Complimentary hors d'oeuvres and champagne will be served.